Who is the best defender? FOR ALL YOU OLD DEFENDERS OUT THERE THIS ONE’S FOR YOU. Suncorp Super Netball is blessed with the best defenders in the world. They are strong, they are tough, they are skilful and they are competitive. Seeing a flying intercept or a strong rebound can lift the roof off any venue. But who is the best by the numbers? 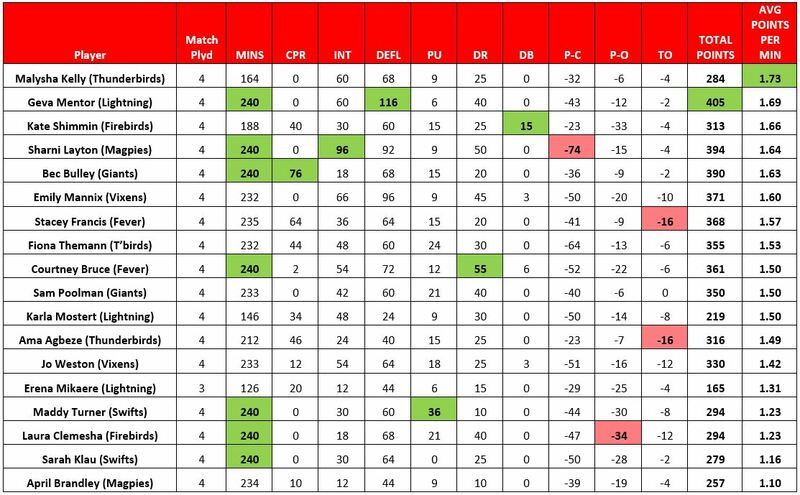 I have ranked our Goal Defenders and Goal Keepers (who have played more than 120 minutes) to find out. By using a simple ranking system I have ranked each defender using the following points system. Seven players have played all 240 minutes across the opening four rounds. Only the Swifts have had their GK and GD on for all four games. Bec Bulley is not only defending her goal but is also providing an attacking option at the centre pass. She has been a centre pass receiver 38 times (76 ranking points). Sharni Layton is the world’s best interceptor. She has taken 16 intercepts (96 ranking points) in four games. Five more than anyone else. Geva Mentor has got her hand in the way of the ball 29 times (116 ranking points). Maybe she needs to hide when it is time to check her nails so she can turn those deflections into intercepts. Maddy Turner, the Swifts’ young gun fights for every loose ball, getting her side 12 loose ball pickups (36 ranking points). Courtney Bruce’s 189cm frame has been able to out jump her opponents 11 times for a total of 55 ranking points from rebounds. Kate Shimmin has the ability to block an attempted shot at goal like no other. She has blocked five goals (15 ranking points). This is more than all other defenders combined. Sharni Layton has been called for contact 74 times (minus 74 ranking points). Her aggressive presence is one of her strengths though as each shooter knows that no goal is going to come easy when Layton is defending them. The Firebirds defenders both defend in your face with Laura Clemesha obstructing 34 times and Kate Shimmin obstructing 33 times. The most combined total by any team. Stacey Francis and Ama Agbeze had turned the ball over 8 times each. Whilst not a massive amount by any means, doing all the hard work to win the ball isn’t being rewarded with a quick turnover. Considering their position on the ladder, it comes as no shock that the Giants defending unit in Bec Bulley and Sam Poolman are currently the best combined defenders in the competition with an average of 370 ranking points for the season. What does come as a shock though (based purely on ranking points), is that the Lightning is the least effective defensive unit with only an average of 263 ranking points for the season. So who is the game’s best defender? Using total ranking points, not surprisingly the competition’s three big guns rank highest. 1st – Geva Mentor has a combined 405 ranking points. However using Average Points per Minute the Thunderbirds’ Jamaican Goal Defence Malysha Kelly leads the way with 1.69 points per minute. Kelly has played 164 minutes so far this season but still features in all the main stat categories. Whilst they often don’t get the accolades they desire, the defenders of any netball team set the tone for the goal pressure at the other end of the court. When defenders are at their best, they have the ability to bring the rest of the team with them.